The trams and buses will take you just about anywhere in or beyond Nice and at 1.50 euros per ride it's very economical. Purchasing the 10-journey multi pass for 10 euros saves even more. Riding the bus or tram is based on the honour system as passengers are required to validate their ticket at a machine located on the buses or trams or face significant fines. Uniformed guards (usually travelling in threes) hop on and off to check at random and one day while on the tram we were required to show our validated tickets. Of course, if you'd rather drive that's an option as well. We were impressed by the many sidewalk electric 'refuelling' stations. This one is on Rue Lech Walesa close to our apartment. Moving back in time we stopped by the Franciscan Monk Monestery and Museum. It is a short stroll from the Matisse Museum in Cimiez (Nice) and well worth a visit. It has been a monastery since the 16th century and one feels a sense of calm and reflection almost immediately upon stepping onto the grounds. The gardens and grounds around the monastery also exude a slower, more gracious style of life. This nativity scene and christmas tree were still on view even in February. If you look carefully (below) you will see a man reading a newspaper while sitting on the steps just outside of the white doorway. I have no idea whether or not he is a monk, but his beautiful surroundings are a definite reminder to slow down and enjoy the moment. This vignette of a bicycle parked outside the monastery also made me think of simpler times. While these walkways covered with grapevines made me green with envy! And of course, admiring flowers in February just made my heart sing. True bliss! Walking back through the park opposite the Matisse Museum (and toward the bus stop) we passed children playing soccer, mothers pushing baby carriages and strollers, as well as joggers and runners on their daily workout. We also saw this group absorbed in a card game - they'd even brought along their own card table and chairs! On another day we headed west of the port to view the spectacular Russian Orthodox Cathedral of Saint Nicolas. Surprisingly, as soon as we saw it we felt as if we'd suddenly been transported (think Star Trek not via the tram!) to Russia. A Russian princess who lived in Nice in the early 20th century urged Czar Nicholas to pay for its construction and he agreed to her proposal. The exterior detailing was exquisite. The rich blue colour was carried inside and used as detailing of gorgeous blue flowers. Photos were not allowed and that's a shame because everywhere we looked were priceless icons guilder in gold, silver and jewels. 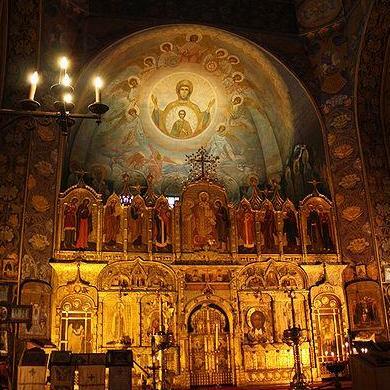 Apparently many were moved from Russia to Nice during the Russian Civil War and as a result the interior of the cathedral felt more like a museum or art gallery than a church. We were in awe. More transporting around the globe...this time on the Quai des Etats Unis in Nice where we spotted a replica of the Statue of Liberty. She's probably less than four feet tall, but still pretty imposing and a reminder New York's Statue of Liberty was a gift from the French people to America. A somewhat larger replica of Michangelo's David is in a park a few blocks away. And a few blocks further is this fountain that makes me think of Italy. Just 20 minutes east of Nice is a peninsula that juts out into the Mediterranean. St. Jean Cap Ferrat offers stunning views both in town and on the walkways that hug the sea. See the steps to the left? Not for me!! After our nature walk we strolled back into the town of Saint Jean Cap Ferrat. These two imposing gates made us wonder what kind of mansion or palace was on the other side and who were the lucky people to call this place home. Back in the town of St. Jean Cap Ferrat is this lovely seat to sit and view the harbour. Pretty cool, huh?! After each day, wherever we'd go, we always returned home and before John could unlock the door and step inside we were greeted by the squawks of Jake and Petra. Our first duty was to drop the gate so they could step outside onto their 'front porch' and then tout suite we'd give them a cracker. We were only too glad to oblige because they're the reason we''re able to explore Nice. Thanks boys!